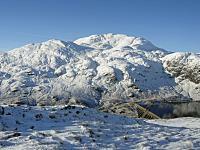 Meall nan Tarmachan is the most easterly of a group of 4 hills, known as the Tarmachan Ridge, and although it is the only Munro, there are two other peaks over 1000m on the ridge. 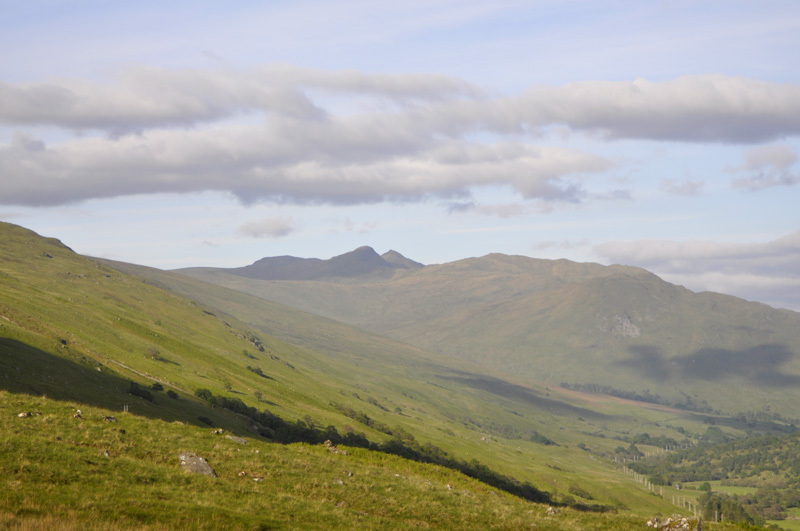 Meall nan Tarmachan has two peaks, the smaller (923m) SE peak being separated from the summit by the crags on Cam Chreag through which the ascent path travels necessitating a minor scramble. 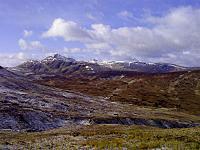 A second, long, ridge runs N to Creag an Lochain and forms the W shore of Lochan nan Lairige. 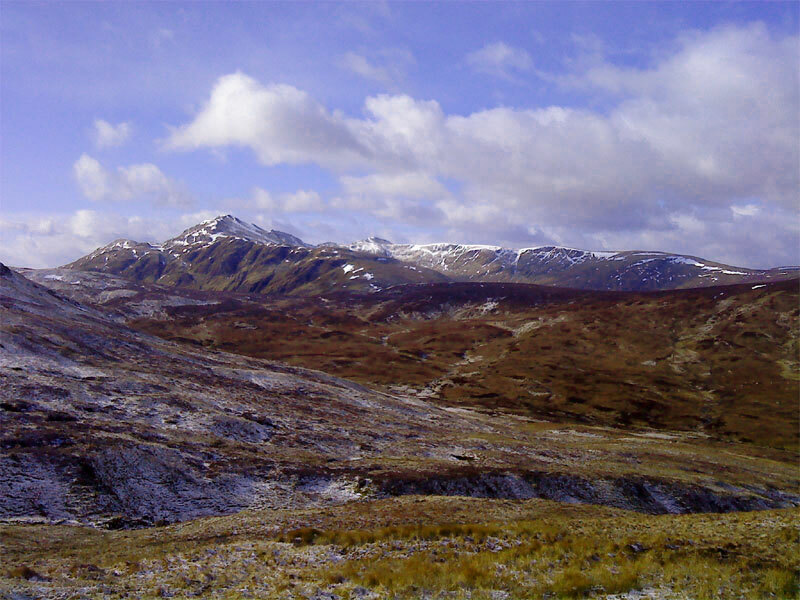 A third ridge SW connects to Meall Garbh and the other members of the Tarmachan Ridge. The terrain is generally easy to moderate grass slopes but with many crags requiring careful navigation. Traverse of the ridge requires further easy scrambling. The summary information of one or more ascent routes that include Meall nan Tarmachan. 1 887 m 12.66 km 4.5 hrs Meall nan Tarmachan Meall nan Tarmachan is the main top of the Tarmachan Ridge and the route described here is the ridge walk. The ascent is easy but for one steep section but traverse of the ridge requires some scrambling on steep descents. 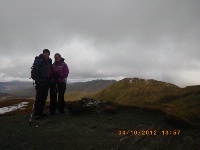 At last a 3rd Munro in the bag - think this was actually easier than most of the Grahams and Corbetts that I've been up! 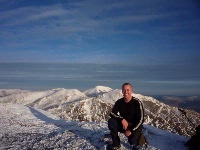 Me on top on of Meall nan Tarmachan 11.12.2012. 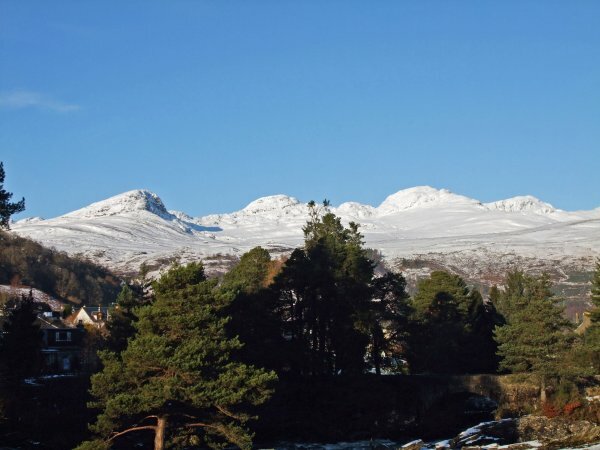 Post a few words about Meall nan Tarmachan or read what others have had to say. Showing the most recent 5 of 21 comments. Would you like to view all 21? High level start of around 500m where there is a small car park that can take 4 cars if parked with consideration.Broke across very wet ground on to steep grassy slopes and headed for the SE top.There is a 2 layer fence that you can follow up thes slopes but remember one of them is electrified! Soon the main SE top comes in to view where you need to take a turn to the right and down in to yet more boggy ground.A very strong snow storm came down on us at this point but battoned down the hatches and up the very steep grassy slope with an intermitent path.Soon back to nice weather and the final push to the ice cover summit of Meall nan Tarmachan 1043m so only a mere 643m or so to the top.Down over no less than 4 Munro tops with the occasional bit of mild scrambling with the weather doing its best at times to blow us off the ridge!Back to cat with time and energy to spare so crossed over another wattery bog towards Meall a Choire Leith. As this was part of a longer mulit-day linear walk, I climbed Tarmachan direct from Killin village and descended into Glenlyon. From the village, I took the road to the bottom of the pipeline. The pipeline has an old railway running beside it! 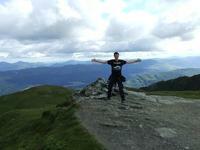 At the top, you can join the tracks which have come in from the Ben Lawers car park. I took the S ridge of Meall Garbh which is straightforward but in retrospect I wish I had joined the ridge further round and enjoyed the scrambling. Northwards, there are alternatives in the dip, but then a new fence is a clear guide nearly all the way to the road. Climbed this East to West as described on this site, a great day for it. I had already been up Beinn nan Oighreagh & Meall Ghaordaidh in the morning, so with you already being halfway up when you park, made this an ideal afternoon choice. Weather was fantastic, views amazing, wee bit hazy, but not too bad. Easy ridge walk, only one wee tricky bit coming off Meall Garbh, but this can be avoided if your not confident.